In this class, we will break down and analyze a couple of popular fiddle tunes and find new and exciting things to do with them! We’ll delve into feel, theory, harmony, accompaniment, and by the end of the camp a couple new arrangements will have been born! A basic theoretical knowledge of notes on the fiddle neck in first position would be an asset, but not a requisite. Jarred Albright has played the violin since he was seven years old and music has been his focus ever since. He trained classically throughout his youth but quickly fell in love with the fiddle style and joined the Calgary Fiddlers Association, of which he was a member for 11 years. He devoured Celtic, folk, old-tyme, and bluegrass styles before entering post-secondary to pursue jazz performance there. Since then he has endeavoured to teach himself to sing and play mandolin, guitar, banjo and ukulele, and spent 5 years as the Calgary Fiddlers' full time mandolinist. In 2012 he and Ben Plotnick were awarded the 10k20 grant from Rawlco radio and their bluegrass duo recorded the self-titled CD Rye & Fairy Tales, to much acclaim. He has spent most of his time since then in Toronto but as of 2016, he is happy to call himself an Albertan again. Music has taken him around the world including the United States, South Korea, Scotland, England, and Ireland. Having recently returned from Toronto to his hometown of Calgary, these days Jarred keeps busy performing with many diverse local acts. 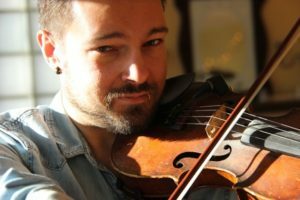 A highly in demand freelance player in Alberta, The Western Swing Project, The Steve Fisher Band, Allan and Arnell, The Calgary Fiddlers, The June Bugs, and Bow Folk are a few of the names with whom he's shared a stage just this summer. Jarred happily spends his days practicing, recording, performing and sharing his love of music with his many students.